History: Male with foot mass. 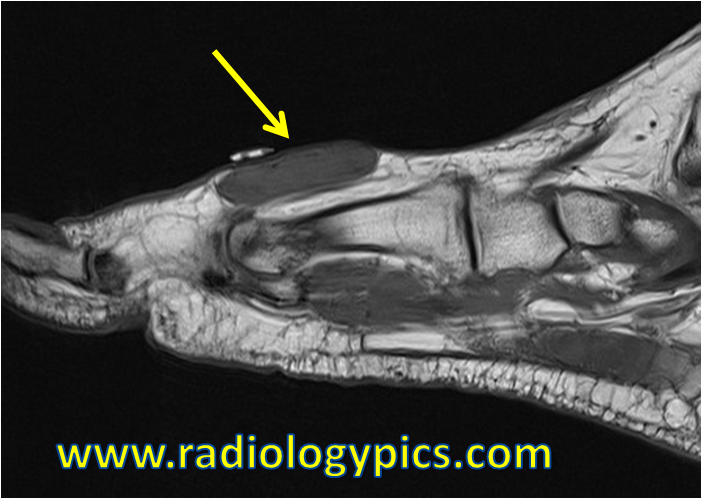 Giant Cell Tumor of Tendon Sheath – Sagittal T1 weighted MRI of the foot reveals an oblong hypointense mass on the dorsum of the foot (yellow arrow). This is a characteristic appearance of giant cell tumor of tendon sheath. Giant Cell Tumor of Tendon Sheath – sagittal STIR sequence shows the mass is hyperintense with areas of internal low signal reflecting hemosiderin deposition and fibrous septations. This is a nice example of a giant cell tumor of tendon sheath, which essentially is a benign proliferation of synovium within the tendon sheath. Giant cell tumors of tendon sheath (GCTTS) are the second most common benign tumors in the fingers after ganglion cysts. On MRI as shown above, GCTTS are classically hypointense to isointense on T1 and have foci of low internal signal on T2 weighted images due to hemosiderin and fibrous septations. On post-Gadolinium images they have diffuse enhancement which can appear heterogeneous. The differential diagnosis in this case would include entities such as tenosynovitis, ganglion cyst, and peripheral nerve sheath tumors such as Schwannoma and Neurofibroma. 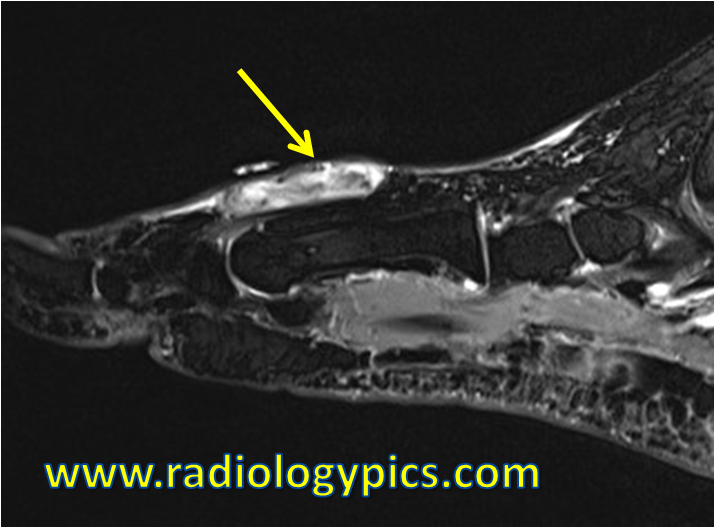 Read an article on giant cell tumors of tendon sheath here.